BACKGROUND AND PURPOSE: The endovascular treatment (EVT) of intracranial aneurysms is no more limited by the presence of a branch at the neck or by the neck width. Saccular aneurysms with a branch arising from the sac, however, are mostly candidates for surgery rather than embolization. We prospectively evaluated the feasibility and safety of the EVT in such cases. METHODS: Between May and November 2004, 9 consecutive patients with a saccular aneurysm that presents a branch arising from the sac were treated by embolization. There were 7 women and 2 men (mean age, 58 years). Six patients presented with a subarachnoid hemorrhage (SAH), and 3 were asymptomatic. All patients were treated by selective coiling with (n = 6) or without (n = 3) the remodeling technique. Clinical outcome was assessed with a modified Glasgow Outcome Scale at 3 months. RESULTS: EVT was successfully performed in all patients and resulted in 7 excellent outcomes and 2 deaths related to SAH complications. The arterial branch could be preserved in 7 cases and intentionally occluded in 2. Neither embolic nor ischemic complication occurred in the vascular territory of the involved branch. Angiographic results showed 5 neck remnants, 2 incomplete occlusions, and 2 complete occlusions. No rebleeding occurred. CONCLUSION: Our study, though limited by its small patient population, suggests that saccular intracranial aneurysms with a branch arising from the sac may be treated by endovascular approach with excellent clinical results; however, larger series with long-term follow-up are mandatory to confirm these preliminary results mostly in terms of anatomic stability. Endovascular treatment (EVT) of intracranial aneurysms has made remarkable progress over the last decade and has been accepted as an alternative to surgical clipping with lower morbidity/mortality rates in selected cases.1 Thanks to the development of protecting-neck devices such as remodeling balloons2,3 and self-expandable stents,4–7 most intracranial aneurysms are now treatable by endovascular approach. The remodeling technique allows coils to be retained within wide-necked aneurysmal sacs.2,3 When the aneurysm neck is too wide, a stent may be placed across the neck allowing subsequent coiling of the sac. Moreover, intracranial stents may induce aneurysm thrombosis in very small lesions.4–7 However, despite these advances, the main limitation for the endovascular treatment remains the presence of a branch arising from the aneurysmal sac. In such cases, there is a major risk of occluding the branch during the procedure and these patients are thought to be candidates for surgery rather than embolization. 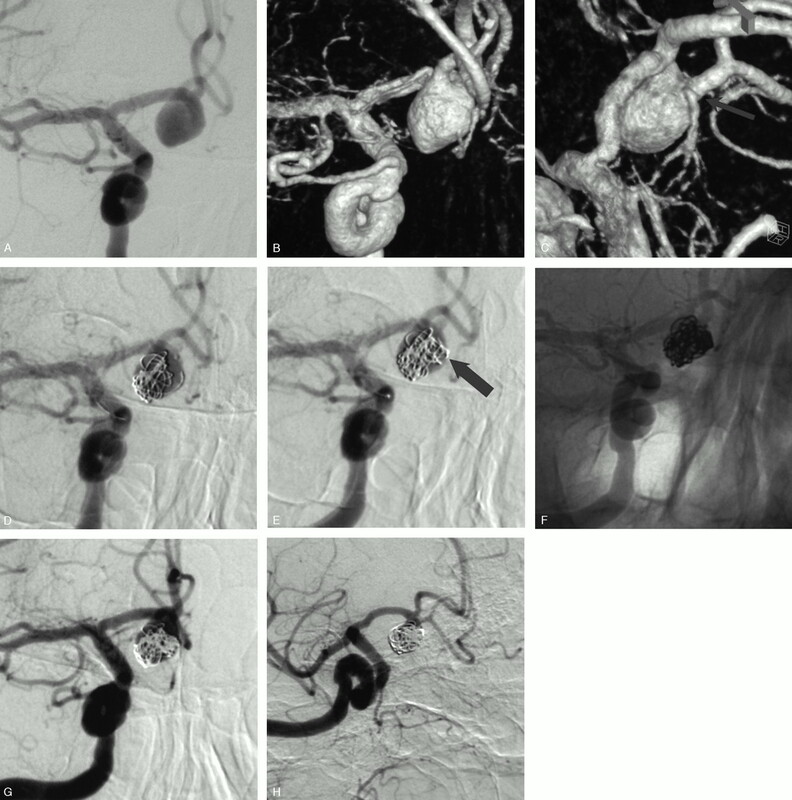 In our study, we prospectively evaluated the feasibility and safety of selective embolization with coils in 9 consecutive patients with an intracranial aneurysm that presented a branch arising from the sac. Between May and November 2004, 45 consecutive patients with 50 saccular intracranial aneurysms were treated in our hospital. Therapeutic alternatives were discussed between neurosurgical and neurointerventional teams in a multidisciplinary decision-making process. Three patients with 3 middle cerebral artery (MCA) bifurcation aneurysms were treated by surgical clipping because of an associated intraparenchymal hematoma (n = 2) or a failure of the endovascular treatment (n = 1). Forty-two patients with 47 aneurysms were treated by endovascular approach. Among them, 9 patients presented with an aneurysm with a branch arising from the sac. As shown in Table 1, there were 7 women and 2 men, with a mean age of 58 years (range, 43–74 years). Six patients presented with a subarachnoid hemorrhage (SAH) and were classified according to the Hunt and Hess scale8: 5 patients were grade 1 or 2, and one was grade 3. In 3 patients, the aneurysm was asymptomatic. All patients underwent conventional angiography of both carotid arteries and vertebral arteries. Aneurysm location and anatomic configuration are summarized in Table 2. Two situations could be encountered according to the vascular territory of the involved arterial branch and its collateral circulation: the branch could be sacrificed because of a sufficient collateral circulation or it had to be preserved. The collateral circulation was judged sufficient by the treating physician (B.L. ), and the decision was made on the basis of objective criteria (balloon test occlusion) or on his judgment. In all patients, the endovascular treatment was performed under general anesthesia and systemic heparinization. The bolus infusion of heparin (20–30 IU/kg body weight) was followed by a continuous drip (1000–1500 IU/h). Systemic heparinization was prolonged for 48 hours in all cases. Patients were treated by selective embolization with Guglielmi detachable coils (GDCs). Technique for the GDC procedure has already been published in the literature.9,10 To protect the arterial branch arising from the sac, a remodeling balloon was used. A 7 × 7 mm HyperForm (Micro Therapeutics, Irvine, Calif) balloon was first placed across the aneurysm neck, and a second microcatheter was positioned within the aneurysm to deliver coils. The balloon was overinflated to clearly bulge within the aneurysm (Fig 1C) to protect the branch. After endovascular treatment, patients were transferred to the intensive care unit, and fluid balance, neurologic status, and blood pressure were carefully monitored. This was particularly important in case of an arterial branch sacrifice. In these cases, no period of hypotension was admitted for 48 hours to stimulate the collateral circulation. 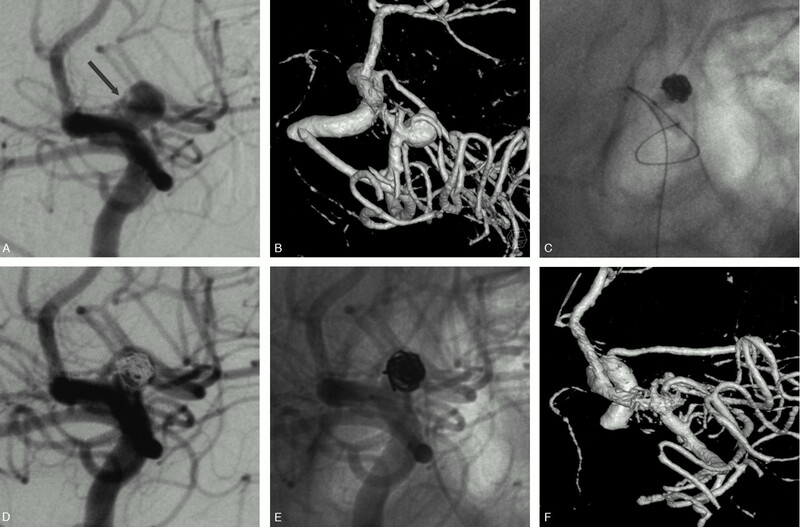 Unruptured MCA aneurysm in a 48-year-old woman treated by selective embolization. A, Conventional angiogram shows a 5-mm aneurysm of the proximal MCA. B, 3D angiogram shows a sylvian branch arising from the sac. C, HyperForm remodeling balloon overinflated in the M1 segment. A part of the balloon is clearly bulging within the aneurysmal sac to protect the arterial branch. D–F, Final angiographic result: conventional subtracted (D), unsubtracted (E), and 3D (F) angiograms show a neck remnant and the preservation of the arterial branch. Patients were evaluated by angiography to document aneurysm obliteration. Angiographic results were classified as complete occlusion (no contrast filling the aneurysmal sac), neck remnant (residual contrast filling the aneurysmal neck), or incomplete occlusion (residual contrast filling the aneurysmal body). At 1 month, a senior neurosurgeon (F.L.) recorded the clinical course, including worsening of symptoms and death. Clinical outcome was graded according to a modified Glasgow Outcome Scale,11 as follows: excellent (neurologically intact); good (mild hemiparesis, cranial nerve palsy, or other deficit that does not interfere with daily functioning or work); fair (significant hemiparesis, aphasia, confusion, or other deficit that interferes with daily activities or prevents a return to work); and poor (coma or severe neurologic deficit rendering the patient dependent on family or nursing staff). Conventional angiographies were reviewed for all patients by 2 senior neuroradiologists together (B.L., D.B.). A 48-year-old woman (patient 4) presented with an unruptured MCA aneurysm discovered at MRA. Her father and sister had previous history of aneurysmal SAH. 3D angiography (Fig 1A) revealed a 5-mm aneurysm of the right M1 segment. A sylvian branch was clearly (arrow) arising from the sac. The patient was treated by selective embolization with the remodeling technique. A 7 × 7 mm HyperForm balloon was first positioned across the aneurysm neck. A coiling microcather was then placed within the aneurysmal sac. The balloon was inflated within the M1 segment and a part of it made a protrusion within the aneurysm (Fig 1B). The balloon was thus sufficiently inflated to bulge within the aneurysm to protect the arterial branch arising from the sac during coils delivery. Conventional angiogram (Fig 1C) at the end of the procedure showed a neck remnant and the patency of the arterial branch. The patient made an excellent recovery and was discharged 48 hours after the treatment. A 74-year-old woman (patient 6) presented with a grade 3 SAH. 3D angiography (Fig 2A) revealed a 9-mm left posterior communicating artery (PcomA) aneurysm. The PcomA was of a fetal type and was arising from the mid-third of the sac. The patient had no P1 segment of the left posterior cerebral artery. Selective coiling was performed with a 7 × 7 mm HyperForm balloon to protect the PcomA. Final angiographic control showed an incomplete occlusion and the preservation of the PcomA (Fig 2B). The patient made a good recovery from embolization but died 10 days later because of a diffuse vasospasm. 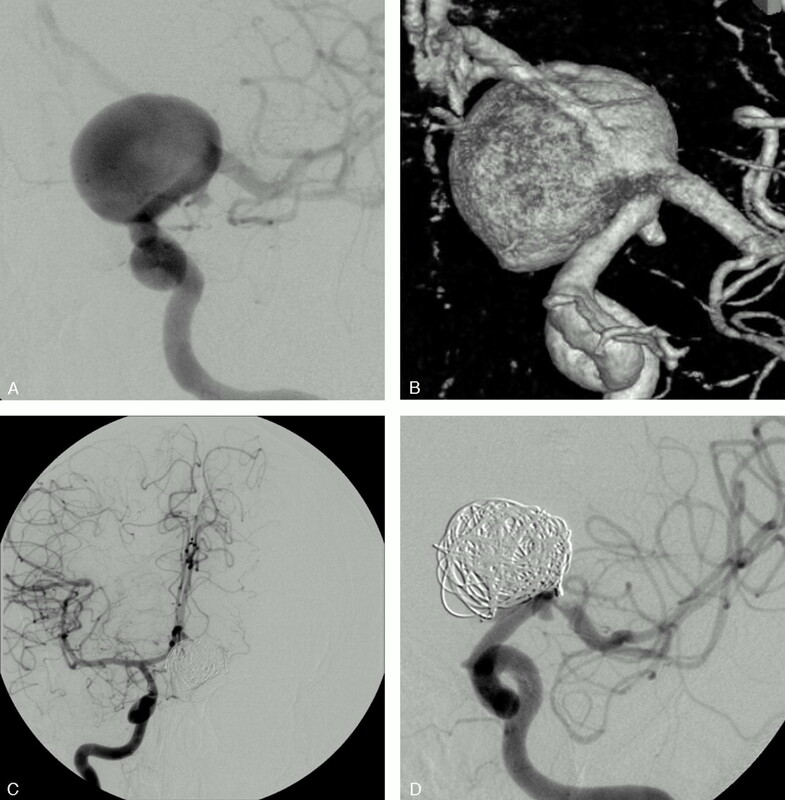 Unruptured MCA aneurysm in a 56-year-old woman. Conventional (A) and 3D (B) angiograms show a wide-necked M1 aneurysm with a branch arising from the sac. C, Conventional angiogram at the end of the embolization shows an asymmetric reconstruction of the neck with patency of the arterial branch. A 73-year-old man (patient 1) presented with a grade I SAH from a ruptured anterior communicating artery (AcomA) aneurysm. Four years earlier, a surgical clipping of this aneurysm failed and it was wrapped. Conventional and 3D angiograms (Figs 3A, -B) showed a 10-mm AcomA aneurysm with the A2 segment from the right ACA arising from the sac (arrow). Selective embolization was performed with the aim to occlude the inflow zone of the aneurysmal sac. A first 3D cage was obtained within the sac with a 10-mm diameter coil (Fig 3C). We tried to deliver the coil with fewest loops near the origin of the arterial branch arising from the sac. This first coil served as a “stabilizing” cage to allow for placement of a second and smaller 3D coil (5-mm diameter) in the inflow zone of the aneurysm (Fig 3D, arrow). This second cage was then filled with helical coils to obtain a sufficient packing (Fig 3E). Conventional angiogram (Fig 3F) at the end of the procedure showed an incomplete aneurysm occlusion and the patency of the arterial branch. The patient received clopidogrel (75 mg/day) and made an excellent recovery. An angiographic control was performed before the patient was discharged home and showed a further thrombosis of the aneurysm (Fig 3G). SAH in a 74-year-old woman. Conventional (A) and 3D (B) angiograms show a wide-necked PcomA aneurysm with the fetal-type PcomA arising from the mid-third of the sac. Conventional subtracted (C) and unsubtracted (D) angiograms at the end of the embolization show an incomplete aneurysm occlusion and the preservation of the PcomA. SAH in a 64-year-old woman. 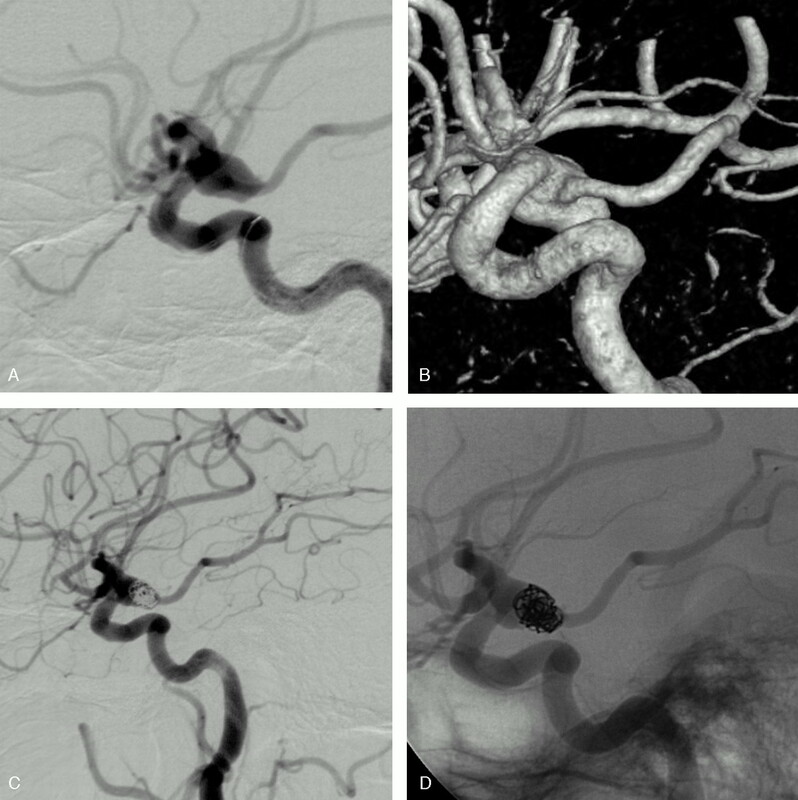 Conventional (A) and 3D (B) angiograms show a 20-mm aneurysm of the left ICA bifurcation with the A1 segment arising from the sac. C, A balloon test occlusion shows the efficient collateral circulation through the AcomA. D, Conventional angiogram at the end of the embolization shows a complete aneurysm occlusion and the sacrifice of the origin of the left A1 segment. SAH in a 73-year-old man with a ruptured AcomA aneurysm previously wrapped 4 years before. Conventional (A) and 3D (B and C) angiograms show a 10-mm AcomA aneurysm with the right A2 segment arising from the sac (arrow). D, Conventional angiogram shows a first “stabilizing” 3D coil of 10 mm placed with fewest loops in front of the arterial branch. E, Conventional angiogram shows a second and smaller (5-mm coil) 3D cage placed in the aneurysm inflow zone (arrow). Conventional unsubtracted (F) and subtracted (G) angiograms at the end of the embolization show an incomplete aneurysm occlusion and the patency of the arterial branch. H, Angiographic control at one week shows a further aneurysm thrombosis with preservation of the arterial branch. Selective endovascular treatment was successfully performed in all patients and resulted in 7 excellent clinical outcomes and 2 deaths. In 2 patients who presented with a SAH (patients 6 and 7), the immediate postprocedural neurologic examination was unchanged, but the patients died because of severe diffuse and symptomatic vasospasm a few days later. No rebleeding occurred over a 3-month follow-up in 6 patients who presented with a SAH. In 7 patients treated with preservation of the branch, no occlusion or embolic complication was observed in the vascular territory of the involved artery. The HyperForm balloon could sufficiently be overinflated—without any spasm or vessel dissection/rupture—to bulge within the aneurysmal sac to protect the branches in 6 cases. In the remaining patient (patient 1) who presented with a ruptured and previously wrapped AcomA aneurysm, the use of 2 separate 3D cages allowed only the inflow zone to occlude and preserved the arterial branch. Only one procedural complication occurred in one of our 9 patients (patient 5). This patient presented with a ruptured 20-mm aneurysm of the ICA bifurcation. The left ACA was arising from the sac and the endovascular treatment consisted of a sacrifice of the A1 segment and coiling of the sac. At the end of the procedure, a thrombus was observed at the MCA origin. An intra-arterial injection of Reopro (4 mg in 10 minutes) prevented any embolic complication and the patient woke up with a normal neurologic examination. Immediate angiographic results included 5 neck remnants, 2 complete occlusions, and 2 incomplete occlusions. In 2 patients (5 and 9) treated with a sacrifice of the branch, the endosaccular coiling was complete. In one patient (6) with a ruptured PcomA aneurysm, the fetal-type PcomA was arising from the mid-third of the sac (Fig 2A). Embolization with the remodeling technique resulted in an incomplete occlusion with patency of the PcomA (Fig 2B). In one patient (1) treated without a remodeling balloon and with preservation of the branch, the occlusion was incomplete at the end of the procedure. An angiographic control performed a week later showed a further thrombosis of the aneurysm (Fig 3G). This preliminary study on a short series suggests that saccular intracranial aneurysms with a branch arising from the sac may be efficiently treated by endovascular approach. Anatomic results and clinical outcomes are encouraging especially because the selected aneurysms were judged difficult for regular endovascular treatment. Thanks to the development of protecting-neck devices such as remodeling balloons2,3 and self-expandable stents,4–7 the endovascular treatment is no more limited by the size of the aneurysmal neck. The first remodeling balloons were used to treat sidewall aneurysms,2 whereas a new, more compliant one (HyperForm) enables one to treat bifurcation aneurysms or small artery aneurysms.3 In case of failure of the balloon-assisted technique because of an overly wide neck, an intracranial stent may be placed across the aneurysm neck to retain coils within the sac. These devices were evaluated in several studies2–7 and showed their efficacy and safety. In case of aneurysms with a branch at the neck, the remodeling balloons may be used to protect the branch. The balloon must be positioned within the origin of the artery and inflated during coil delivery. Nevertheless, the protection of an arterial branch arising from the sac remains technically challenging and most of these aneurysms are thought to be candidates for surgical clipping rather than for embolization. In our series, we prospectively evaluated the feasibility and safety of the endovascular treatment in such cases. In 2 patients (5 and 9), the branch could be occluded with the aneurysm thanks to a sufficient collateral circulation. The decision of an arterial sacrifice was made by the senior neurointerventionalist (B.L.) and was based on either objective criteria (test occlusion) or published data.12 In this situation, the key point of the endovascular treatment is the assessment of the anatomic supply with or without a test occlusion. If this assessment is not possible, there is a risk of ischemic complication and the case should be discussed for a surgical clipping. In the remaining 7 cases, the aims of the treatment were to sufficiently occlude the aneurysm and to preserve the branch. Thanks to the development of the very compliant HyperForm balloon, it was possible to overinflate the balloon to bulge within the aneurysm to protect the arterial branches in 6 cases. The biggest available HyperForm balloon (7 × 7 mm) must be used because of the need for overinflation. In one patient (1), however, a remodeling balloon could not be used because of the anatomic configuration of the aneurysm (Figs 3A, -B). A selective treatment was performed with the aim to mostly occlude the inflow zone of the aneurysm to achieve a sufficient occlusion and to preserve the branch. It could be done by delivering 2 separate 3D cages within the sac with subsequent filling of the smallest one at the inflow zone (Figs 3C–G). In this series, there was no clinical complication due to the EVT; however, 2 patients died because of vasospasm. In all patients who presented with SAH, including the 2 patients who died, aggressive triple-H therapy could be applied even if the aneurysm occlusion was not complete. Indeed, in all cases, the most fragile portion of the aneurysm (ie, the aneurysm dome) was completely occluded so that the risks of the triple-H therapy were judged to be very low by the neurovascular team. One might think that some of our patients could be treated by surgical clipping because of the complex anatomical configuration of the aneurysm. In our institution, however, the endovascular approach is attempted in all patients if it is judged technically feasible by the senior neurointerventionalist (B.L.). Anatomically, our results may be criticized in aneurysms (n = 7) treated with preservation of the branch. Five neck remnants and 2 incomplete occlusions were expected—because of the definition and selection of our population group—and seen after embolization. Long-term follow-up is thus mandatory to draw final conclusions mostly because some might think that a surgical clip could be more stable in these cases. Clinical outcomes were excellent in most cases and no procedural complication related to the preservation or the sacrifice of the branch was observed. Moreover, one patient (1) with a ruptured aneurysm was not eligible for surgical clipping because of a previous wrapping and he made an excellent recovery without rebleeding. Finally, one must be aware that aneurysms with a branch arising from the sac remain technically challenging to treat by endovascular approach. It requires a good amount of experience in the EVT of intracranial aneurysms especially with the use of the remodeling technique. Our study, on a small series of patients, illustrates the feasibility and safety of the endovascular approach in the case of intracranial aneurysms with a branch arising from the sac. Clinical outcomes are very encouraging especially because of the selected population of difficult aneurysms. Future and larger series with long-term follow-up, however, are mandatory to confirm these preliminary results, mostly in terms of anatomic stability. Accepted after revision June 14, 2005.